Welcome to the Akita International University Library. The Library opened in 2004 with the foundation of the university, and in 2008, a new library was established. 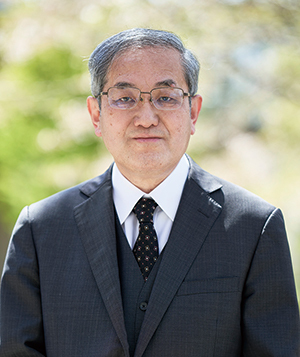 In 2014, the library was renamed to the “Nakajima Library” in honor of former President Mineo Nakajima, who contributed greatly to the university’s foundation. The feature of the library is as follows. Firstly, the library is open 24 hours per day, 365 days per year, for students, faculty and staff members, and is called the “library that never sleeps.” Secondly, the library is a two-story architecturally beautiful semi-circled building that utilizes a generous amount of Akita-cedar in its construction, leading to this “Book Coliseum” design to receive many architectural awards. The library not only has a visual appeal to users, but its relaxed and quiet atmosphere also makes it possible for users to read and study intensively. Thirdly, the library contains about 77,000 books, which are mainly composed of English books. Not only basic academic books are available, but also extensive collections of books on Japanese culture and history as well as linguistics and literature books are held. Fourthly, the library is also open to the local community. Citizens may use the library from the morning until 10 pm on weekdays, and until 6 pm on weekends and holidays. And lastly, the library is a designated United Nations Depository Library in 2013. Through this, library users can study the activity and role of the UN.In recent years, the rapid spread of the internet and rise of digital materials have had an impact on the collection and services of academic libraries. The Nakajima Library has therefore licensed e-resources, such as databases and e-journals, which are now indispensable resources for education and research. Most notably, more than 250,000 academic e-book titles in English have been on offer since 2014. Currently, the library endeavors to construct a hybrid library system that enables users to seamlessly print materials and e-resources anytime and from any location. In addition, the library is continually striving to acquire more information resources and provide advanced services to support educational and research activities in the field of global liberal arts. We welcome and are looking forward to visiting students, faculty, staff members, and community citizens to actively study and conduct research.